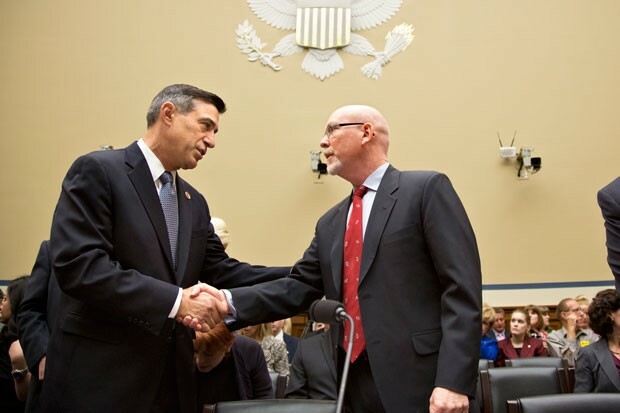 Rep. Darrell Issa greets Gregory Hicks, former deputy chief of mission in Libya. Benghazi was a tragedy, a terrible tragedy and because of it a light should be shone on what more can be done to protect those who serve America overseas. What our country does not deserve is a political show trial designed to vilify Hilary Clinton and Barack Obama. What we don’t need is a crass partisan effort to influence the 2016 presidential campaign. Unlike the 1980s Iran-Contra scandal, there are no questions of illegal acts, no secret funds, no shredding of documents and no efforts to directly circumvent a law passed by Congress. People may forget that 14 administration officials were indicted and 11 convicted as a result of the arms-for-hostages scandal. Instead, what we have after eight months of investigation, 11 congressional hearings before five committees, 20 staff briefings and 25,000 pages of documents is exactly what we started with: a tragic situation with lessons to be learned, but not a grand conspiracy. It is sad that Rep. Darrell Issa has decided not to conduct a series of hearings to help solve the problems that out diplomats face every day but rather to engage in a partisan, political witch hunt for a conspiracy and cover-up that doesn’t exist. If he were truly interested in solutions he would have Ambassador Thomas Pickering and Admiral Mike Mullen – the chairman and vice chairman respectively of the State Department’s Accountability Review Board which investigated the incident – before the committee to discuss the 29 recommendations that they proposed. He would seek more ideas on boosting security, not cutting funds for the State Department that many in his party have so enthusiastically embraced. As for Issa’s political motives, take it from Iran-Contra, when many Democrats thought it would influence the presidential campaign of 1988. It didn’t. I can speak from experience. Our ads linking George H.W. Bush to the scandal really fell on deaf ears. Voters were done with it; it was in their rear view mirror. Republicans who think that Benghazi will be an issue in 2016 should think again.